Oh hello there, Blush Pink, fancy seeing you here! Hands up… who hasn’t really considered a blush kitchen as an option? Yea…. until now, it wasn’t my first choice either. 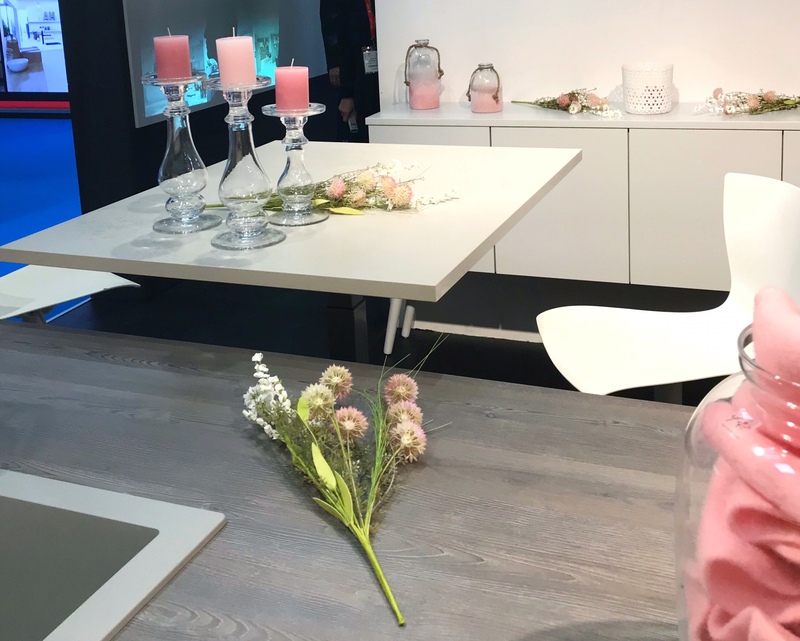 But, during my visit to KBB Birmingham 2018, I saw a couple of gorgeous blush kitchens that used this on-trend colour in their displays. And I fell in LOVE! Check out the striking bank of tall units in blush pink, with integrated handles and no fussy trims in the picture above. Keeping it simple with the units all aligning and only one appliance on display helps make this colour a real statement without it looking too much. Having this feminine and pretty colour on slab doors, not traditional or shaker-style, also eliminates the chance of the overall feel of the kitchen being too ‘cutesy’. The rest of the kitchen had a very toned down, natural and romantic feel, using soft, distressed timbers and pale grey frontals. This kept the pink as a feature, ensuring the overall feel wasn’t too overpowering. 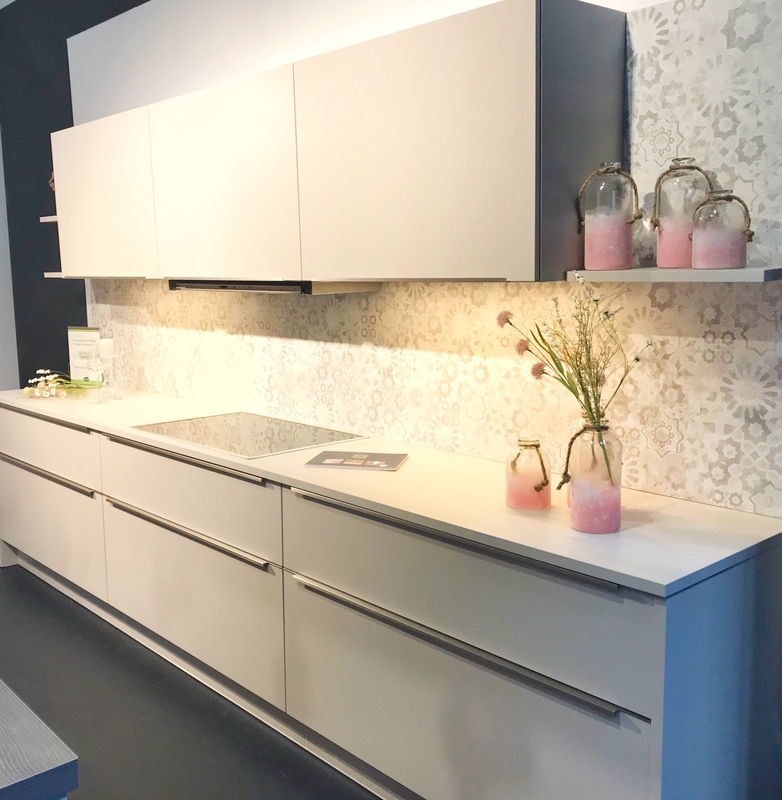 The worktops are the same colour and pattern as the units they are on, which is a popular theme coming in at the moment and looks amazing when done well. The splashback used behind the stretch of wall units in the picture above brings interest and texture, softening the strong lines from the units. It’s GORGEOUS and at first glance, I thought it was tiled. I love the way the dressings for the display add pops of colour, while the wildflowers are so whimsical and romantic, complimenting the wallpaper. The slab doors and streamlined feel of the kitchen would have been too clinical had it not been for these touches. I was also drawn to the seating area, created from the same worktop used on the hob wall, but lifted up a level in order to set this social area apart from the main kitchen. So, it’s your turn! What do you think? Would you have pink in your kitchen?